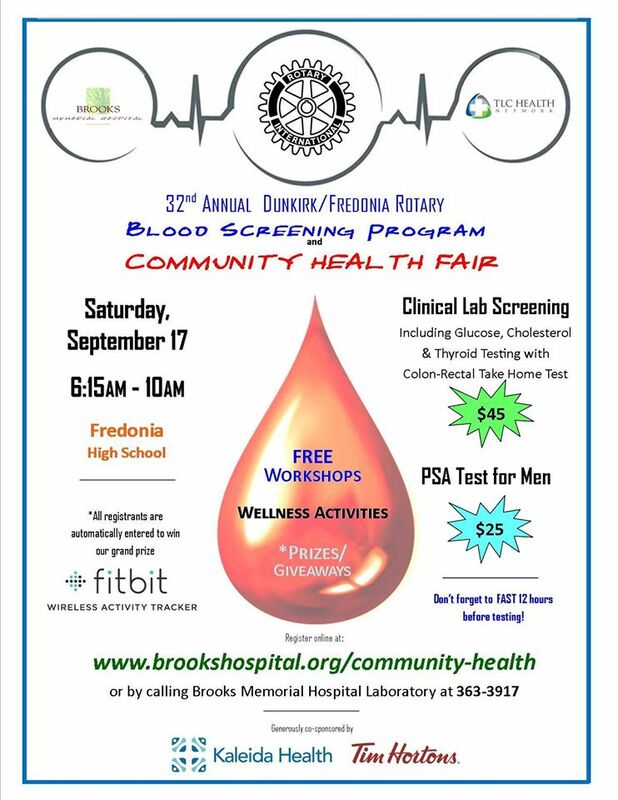 The 32nd Annual Dunkirk/Fredonia Rotary Community Blood Screening and Community Health Fair is scheduled for Saturday, Sept. 17th from 6:15am – 10:00am at Fredonia High School. To register, visit www.brookshospital.org/rotary-blood-screening or simply call 363-3917 Monday-Friday between 8 am and 4 pm. Provide an email address and be automatically entered to win a Fitbit electronic fitness tracker! Proceeds from the annual fundraiser are used to provide community health programs such as free child immunization clinics, and supports other civic projects such as the beautification of RusseThe 32nd Annual Dunkirk/Fredonia Rotary Community Blood Screening and Community Health Fair is scheduled for Saturday, Sept. 17th from 6:15am – 10:00am at Fredonia High School. ll Joy Park in Fredonia and the construction of the Skateboard Park in Dunkirk. Register today! — with Kaleida Health, Dunkirk Rotary Club, Fredonia Rotary Club, Tim Hortons: Fredonia & Dunkirk and TLC Health Network.